This post is sponsored by Mann’s. 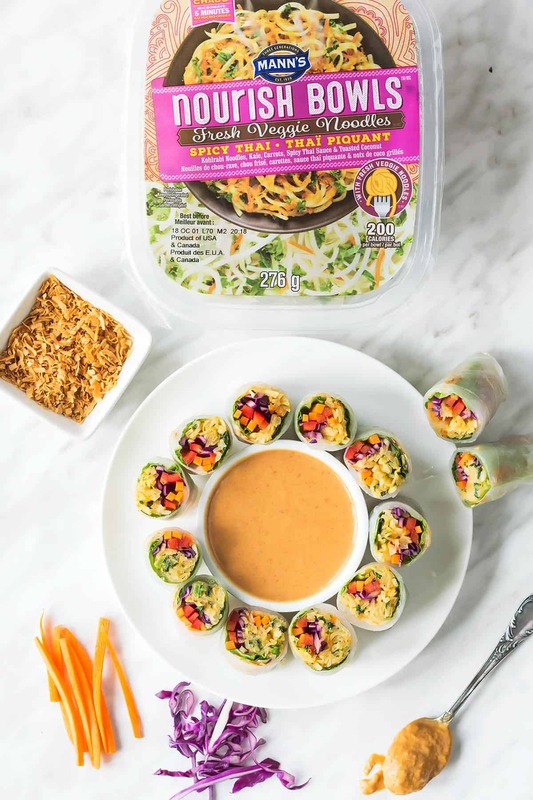 The fresh veggie noodles from their Spicy Thai Nourish Bowl give today’s rice paper rolls a delicious and healthy twist. 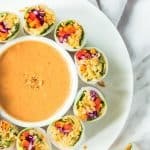 These summer rolls make a fantastic appetizer, but you can also add your protein of choice to turn them into a healthy filling meal. What are rice paper rolls? 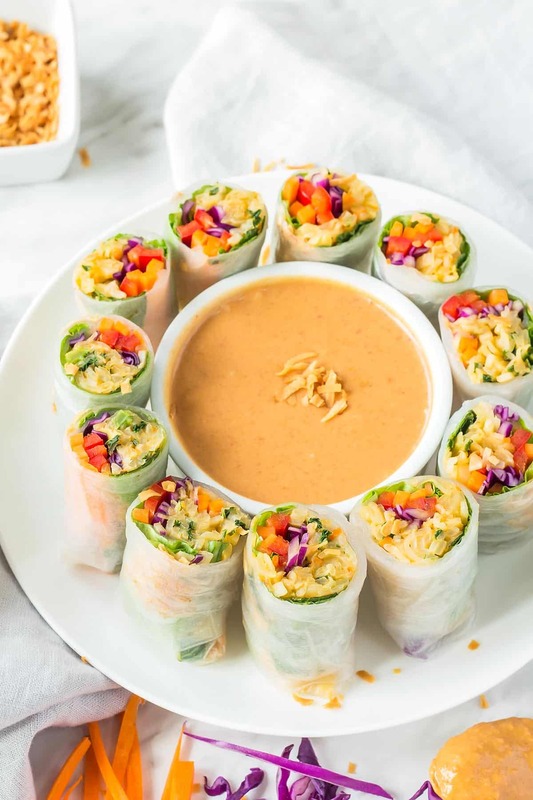 Whether you call them rice paper rolls, summer rolls, fresh spring rolls, Vietnamese spring rolls, or gỏi cuốn – essentially they are softened rice paper sheets filled with an assortments of veggies, herbs, rice noodles and protein. 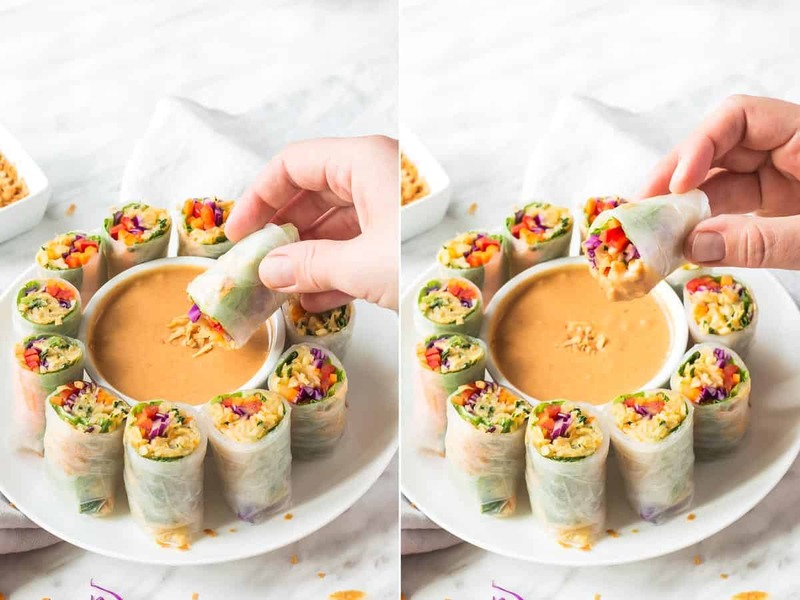 Unlike regular spring rolls, these summer rolls are eaten fresh right after rolling. No need for frying! They are of Vietnamese origin, where their name gỏi cuốn means salad roll. I first enjoyed these fresh spring rolls during a visit to Vietnam in 2012. Eating what is essentially a cold salad wrapped into a neat roll dipped into the most amazing peanut sauce while sitting on little stools on the side of a busy Ho Chi Minh City street, was exactly what we needed on that hot and humid first evening in the country. I had these first as prawn rice paper rolls. You may have seen them before where the pink seafood is put right on the outside and only covered by a thin layer of transparent rice paper. But on our second stay in Vietnam, when we lived in Hoi An for 3 months in 2016 I learned that gỏi cuốn can be filled with pretty much any protein from shrimp and seafood, to pork slices, sausage, beef, or egg. This is the way my husband enjoyed them the most. At one of our go-to restaurants you could order DIY rice paper rolls. He would always order the egg version, which means they brought out a large fried omelette alongside rice paper sheets, a container of warm water, softened rice noodles, and a variety of herbs and greens. So he could assemble his fresh rice paper roll with strips of omelette and wrap them with the other ingredients right at the table. I am telling you all this to say that you can put into rice paper rolls whatever your heart desires. That’s what I did! My version today repurposes Mann’s Spicy Thai Nourish Bowl. I love how they make healthy convenience food that you could easily prep and eat at the office. >> Check out their whole Nourish Bowl selection here! Since I don’t actually work at an office and have a little more time for making lunches I took the fresh noodle concept a little further. The kohlrabi noodles reminded me so much of rice noodles that I used them to replace the rice noodles typical for fresh spring rolls. For that I sautéed the spiralized kohlrabi noodles for about 5 minutes until they softened. Then I added the included Thai red curry sauce to them. I wrapped up the veggie noodles together with a rainbow of my favorite veggies and greens: julienned carrots and bell pepper, shredded red cabbage, lettuce, mint and basil leaves. You can easily find rice paper sheets (bánh tráng) in any Asian market or in the international aisle of a larger supermarket. Otherwise you can always resort to Amazon. First, you’ll need to dip the sheets in warm (not hot) water to soften them. In Vietnam they had special halfmoon shaped bowls for that. A larger bowl also works. Turn the sheet in it until all parts are moistened (I did that in the video below). But you could also submerge the entire sheet in a large dinner plate with a rim. Just be sure not to let it soak too long that it starts disintegrating. Lay the soaked rice paper sheet down onto a cutting board or any clean surface. Place your fillings in the middle of the bottom half of the paper. I like to start with some herbs – a mint and a basil leaf. Now add the veggie noodles, fresh veggies, and lettuce on top. Fold over the bottom of the rice paper sheet and tuck it in under the veggie filling to create a tight little pouch. Now fold over the right and left side of the rice paper toward the center to close up the ends. Keep rolling up the rice paper roll from the bottom. 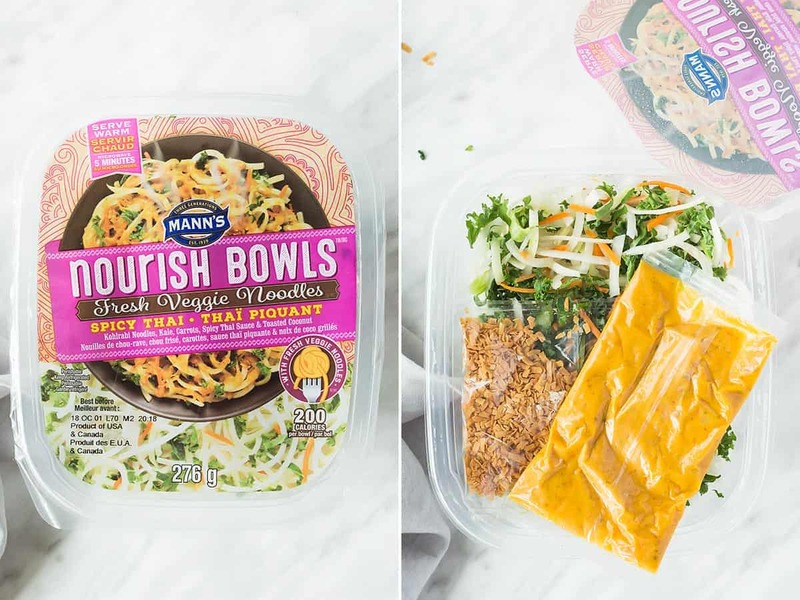 Sprinkle a little toasted coconut that is included with the Nourish Bowl on the last inch of rice paper before rolling it up. This is just for a nice visual effect. In Vietnam fresh rice paper rolls are served with a mix of hoisin sauce and ground peanuts or nước chấm – a fish sauce based dipping sauce. But from the first time I tried summer rolls, what stood out most to me were the peanuts in the dipping sauce. So I serve mine with my favorite coconut milk based peanut sauce. The sauce is a simplified version of my Thai Peanut Sauce from these spaghetti squash peanut noodles. Instead of making a big batch of cooked sauce, I modified and cut down the recipe, so that all the sauce ingredients can be easily mixed up in a mason jar. I am still using Thai red curry paste as the seasoning. Since that is a little difficult to dissolve just by shaking in a jar (especially when cold from the fridge), I add that first together with a little coconut sugar and hot water. With a spoon or thin spatula I whisk and stir these around until fully dissolved. The rest is as easy as adding the coconut milk, natural peanut butter, soy sauce (Tamari to make gluten free), apple cider vinegar, and sesame oil. Close the lid of the jar and shake for a minute or so until everything is fully combined. Transfer the peanut sauce to a small bowl for easy dipping. I kept my summer roll recipe simple and heavy on the veggies. For that reason they are more suited as an appetizer or snack. 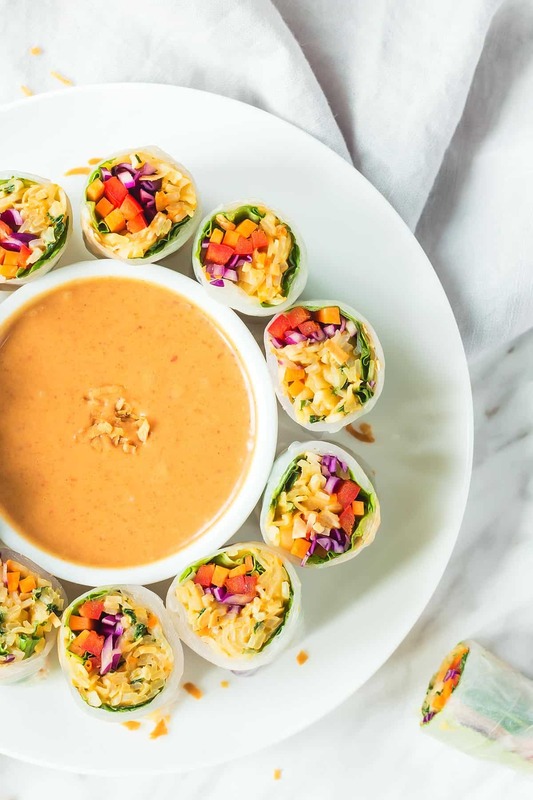 Serving them with just the peanut dipping sauce is more than enough. 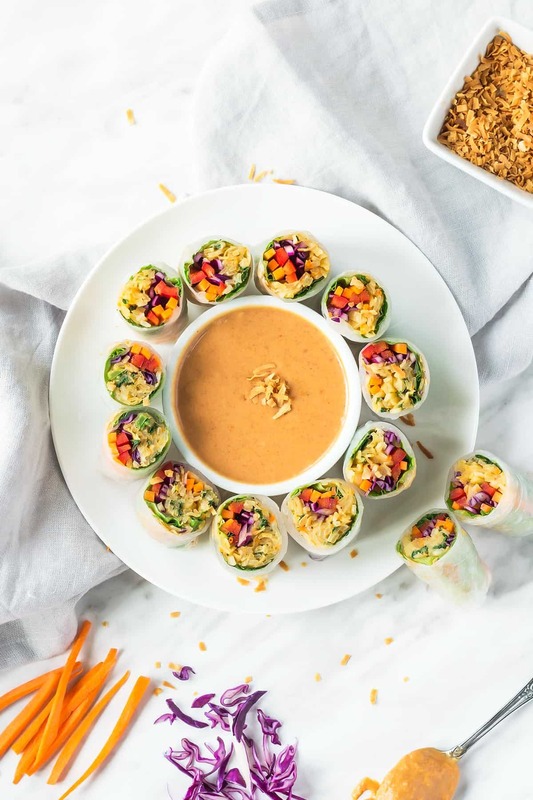 However, if you want to turn these Vietnamese rice paper rolls into a main meal, be sure to add a filling protein when rolling everything up. Anything from grilled chicken, tofu, shrimp, pork sausage, beef works well. A side of steamed or fried rice could easily complete the meal then. These easy rice paper rolls are best enjoyed the same day as you prepare them. But if you end up with leftovers or want to pack them up for lunch put them in an airtight container in the fridge for up to a day. For any time longer you’ll need to wrap them in a plastic bag or silicone pouch. But keep in mind that the softened rice paper is sticky and the rolls might stick to each other. To prevent that from happening you can also wrap them in plastic wrap or bee’s wax wraps. 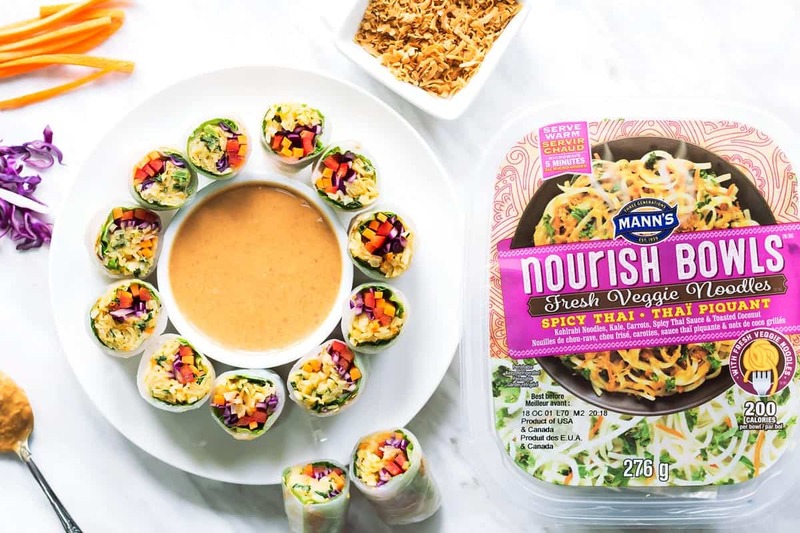 Open the Spicy Thai Nourish Bowl and remove the sauce and toasted coconut packages. Prepare the veggies noodles either in the microwave according to package instructions or sauté them in a pan with 1/2 tablespoon oil for 5 minutes. Then add the contents of the included spicy Thai sauce, stir to combine. Heat 1 more minute, then set aside. Soften 1 rice paper sheet at a time in a bowl or plate of warm water. Lay it out on the countertop or a cutting board. Arrange the veggies in the middle of the bottom half. Start with a basil and mint leaf, top with sautéed spicy Thai veggie noodles, shredded cabbage, bell pepper, and carrot sticks. Top with a small leaf of lettuce. Fold the bottom of the rice paper over the veggies and tuck it in underneath. Now fold over the right and left side, then continue rolling up the fresh spring roll from the bottom. Sprinkle a little of the toasted coconut from the package on the last inch of rice paper before rolling that up as well. Continue in the same way with the remaining rice paper sheets and vegetables. To make the dipping sauce, add Thai red curry paste, coconut sugar and hot water to a mason jar. Stir with a spoon or small spatula until everything is dissolved. Now add the coconut milk, peanut butter, soy sauce, apple cider vinegar, and toasted sesame oil. Close the jar and shake the contents until well combined. Serve the fresh spring rolls with the dipping sauce on the side.